More than 7,000 children have been placed in state-run institutions in Europe's poorest country, Moldova, and only 2% are orphans. While the horror stories of the orphanages of 1990s Romania were widely publicised, the conditions facing children in neighbouring Moldova are not well known. Widespread poverty and a lack of basic social services are blamed for a situation which aid groups argue violates a child's right to a family, as enshrined in the UN Convention on the Rights of the Child. In the capital, Chisinau, the institutions are surprisingly well maintained. From the outside, the one I was able to visit looked like a school, with plants and a play area, while inside there were pictures on the walls and toys on display. Yet the first thing you notice is how quiet it is: dozens of young children live in the institution, but you do not hear any noise. The toys are not being played with; instead children are lying in cots. In one room is a group of about a dozen toddlers. These youngsters rarely go outside, says Lavinia (not her real name), who works with Hope and Homes for Children, a charity that tries to return children to their families. Instead, the children spend almost all of their time in just two rooms. In the corner, a disabled child is left lying in vomit. No pictures indoors are allowed. The manager says there are not enough staff to take the children outside, although there appear to be more staff than children. Lavinia is clearly frustrated by the attitude, but there is little she can do, even though she is working with local authorities on reforming childcare services. "What we need is to inform and educate families," she says. "If we can develop family alternatives, this would prevent more children having to live like this." 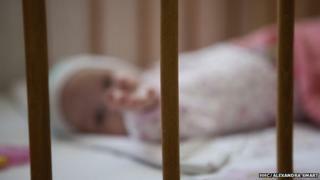 In another room, 10 newborns lie alone in cots. The institution's manager does not know their sexes. The standards are shocking for Sarah Butterworth, a UK mental-health specialist on children in care who is visiting at the same time. "[Knowing] how the brain develops in the first few months of life means I can only imagine the damage that is happening before our eyes," she says. Although basic needs appear to have been met, these do not look like valued children. Most of them are not even orphans; they have families but have been abandoned because of poverty and an outdated social reliance on state care. Moldova's Soviet legacy still remains, and reliance on the state care is embedded in people's attitudes and the law, according to Dr Delia Pop of Hope and Homes for Children. "For many, institutional care has become the only option," she says. "The irony is that it gets called 'childcare', even though this is one of the most damaging systems for children." The authorities accept changes are needed but say one of the biggest obstacles is the weakness of the Moldovan economy. "We want to reform institutions for babies and young children," says Svetlana Chifa, head of the Child Protection Department in Chisinau. Unemployment in Moldova is high and young adults often head abroad to find work, leaving their children behind to the state. They believe what they are doing is for the best. There is also the stigma of disability. A three-year-old I visited, who has been helped into a foster family, was abandoned simply because he was born without an arm. The situation is even harder in the breakaway eastern region of Trans-Dniester, which is technically part of Moldova but sees itself as a separate country. "Trans-Dniester has an attitude for independence, and has strong connections with former Soviet countries," says Dr Pop. This gives aid workers additional challenges in encouraging co-operation to get children out of institutions and back with their families. Visiting the region is like going back in time. Placing children in such institutions is simply firefighting an ever-expanding, complex social problem rather than offering a long-term solution for the many children within their walls, says children-in-care specialist Sarah Butterworth. Even when compared with children living in the most deprived of households, children in care are more likely to grow up as dysfunctional adults. "Years of research have shown the importance of family-based care and attachment, which children in institutions just aren't offered," she says. Developmental needs, attachment, love and consistency are overlooked. The authorities in Moldova acknowledge solving this problem is about changing ingrained attitudes and will not happen overnight, partly because many who work in such institutions have a vested interest in them remaining open. "People are cautious about changes," says Svetlana Chifa. "The institutions are their livelihoods and people could lose their jobs when they close."